CHARLOTTESVILLE, Va. — Rick Carlisle, current head coach of the Dallas Mavericks and former UVa. Cavalier, was the guest speaker on Friday, September 27, at the University of Virginia. Carlisle, who returned to his old Alma mater in Charlottesville, was excited to share his experiences with UVa’s third year students during their annual traditional ring ceremony as he returned on the day that practice officially tips off for the Virginia men’s basketball team. Virginia began the ceremonial tradition for third-year students to receive their class rings about 15 years ago and annually invites a speaker with a university connection. This year Rick Carlisle held the honor. NBA coach and former UVa. 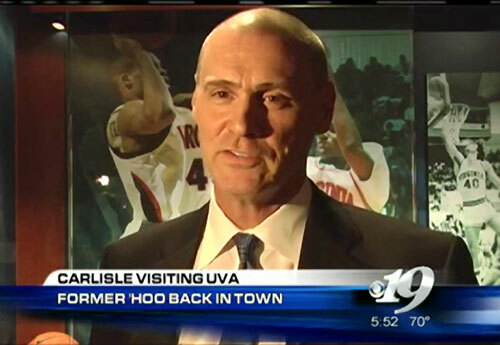 Cavelier, Rick Carlisle, returned to his old Alma mater on September 27, 2013, in Charlottesville, VA. as the guest speaker at the University of Virginia. “I have been fortunate,” he said. “The experience I had at Virginia set me up to be opportunistic with the NBA, and while my (professional) playing career was only five years, it connected me to NBA coaching. Bill Fitch (Nets) both cut me and hired me in the same phone call. Carlisle, who won the 2011 NBA Champion for Dallas, enters his sixth season as the head coach of the Mavericks. He previously coached the Indiana Pacers and Detroit Pistons, and was also a player in the NBA. He is one of only 11 people to win an NBA championship both as a player and as a coach. If you would like to book basketball speakers like Rick Carlisle for a speaking engagement, appearance, endorsement, or corporate event, contact our booking agent for appearance and speaker fees at Sports Speakers 360 or call 1.855.303.5450.